As U.S. industry geared up for wartime production, Gruen formed a War Instruments Division at Time Hill. The new operation, which made gauges and indicators for the military, was Gruen's first forray into electronics. Along with other companies doing war work, Gruen showed their military products in ads. This was a way to demonstrate that they were doing their patriotic duty, and a way to keep the Gruen name in the minds of consumers while there was a shortage of watches. Among the items shown in these ads were gauges on electric-knife and metal-detector control unitsboth were devices used in surgery. The metal detector helped locate bullets, shrapnel and other metal fragments in the bodies of the wounded, and the electric knife cauterized the incision as the surgeon cut with it. The metal detector was ready at the start of the war, and was used during and after the Pearl Harbor attack. Ads also showed gauges and indicators used on aircraft radio direction-finders and antiaircraft-gun aiming mechanisms, and the roll indicators used for electrically firing the guns on battleships. 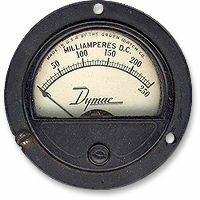 Right: A Gruen ammeter, formerly part of an aircraft electrical system. Signed "Made in the U.S.A. by the Gruen Watch Co." around the top of the dial, and "The Gruen Company, Cincinnati Ohio" on the back. Base metal with a glass crystal; 70mm in diameter. There was a huge need for Gruen's new products. A newspaper article about Gruen's changeover to military production claimed that a submarine required 150 gauges and indicators, a bomber 250 and a ship over 1000. Gruen made the changeover to this new type of production on its own initiative, without the need for government grants or loans. The U.S. Army Signal Corps, responsible for radio communications, used large numbers of Gruen gauges on their electrical and electronic equipment. Many of these gauges had second lives after the War, serving amateur radio operators. The Cincinnati Enquirer later revealed that Gruen instruments had played a role in the development of the atomic bomb. Gruen was classified as an essential industry, and Time Hill employees went on a 48-hour workweek during at least part of the War. They also starting running two shifts, which they had not done previously. 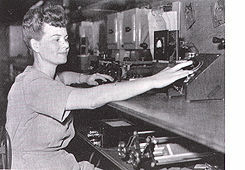 Left: A Gruen employee in the War Instruments Division at Time Hill, from a 1943 issue of Gruen's employee magazine. The gauge in front of her looks similar to the one above. 98% of Gruen's war manufacturing was done by women. The Precision Factory in Switzerland continued to produce civilian watches without interruption, but these were not imported in the same quantities as they had been in peacetime. Competitors like Hamilton, which had facilities only in the U.S., suspended all non-military watch production until after the War. Gruen did not make timepieces for the U.S. military, since their watch production depended on their overseas factory. For strategic reasons, domestic sources for material were preferred, if possible, for all WW II military production by the United States. One serious problem for the Company was the fact that trans-Atlantic phone calls for commercial purposes were forbidden during the War years, so all communication between Time Hill and the Precision Factory was by surface mail. This made it impossible for the two parts of the Company to coordinate with each other in a timely fashion. On an amusing note, in 1943 the company sent each employee who was away serving in the military a cigarette lighter as a Christmas present. 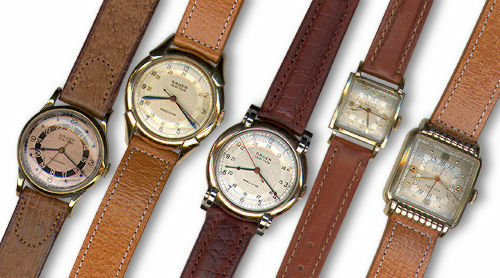 Above: Although Gruen did not manufacture watches for the U.S. military, they offered the public a collection of eight military-style watches, to be used as personal watches by (or gifts to) men and women doing military service. Each model was intended for a particular branch of the militarythe Veri-Thin Dix, above, was for the Army. Selling for $39.75 in 1941, ads show it with a Guildite (Gruen's steel alloy) bracelet, but this one has a contemporary-looking khaki strap. The Guildite case is 28mm in diameter; the gray dial has luminous hands and numbers under a plexiglass crystal. Because Time Hill was busy with War work, these were imported as complete watches; the cases were not American-made, as was normal for Gruen. Gruen President Benjamin Katz was called to become a member of the War Planning Board, and spent much of his time in Washington D.C. The Board was made up of top business executives, and was formed to help the government manage and coordinate wartime production among the thousands of companies and factories involved. Board members were paid a token salary of one dollar per year. Having gotten a taste of large military contracts, Gruen would continue to pursue them after the War ended. This would eventually lead to the company's downfall. Wartime production and military service meant that the U.S. suddenly had nearly full employment. Emerging from the shadow of the Great Depression, many people found themselves with spending money for the first time in over a decade; many, (especially women with wartime jobs) for the first time in their lives. This caused a large demand for watches, but because the watch companies were exclusively doing War work, no American-made timepieces were available to civilians. The better Swiss brands were virtually unknown in the U.S. prior to this time, but many retailers started importing them to fill the huge demand. This enabled the Swiss to establish a strong presense, building brand recognition, establishing dealer networks and distributorships, and gaining a secure foothold in the U.S. while the domestic U.S. watch industry was temporarily absent. In the prosperous times after the War, Omega, Longines, LeCoultre and other Swiss companies held on to this new market, aided by the fact that many U.S. companies were not able to resume normal production until considerably after the end of hostilities. Competition from the Swiss in the middle and high-end price ranges, where there had been no foreign competition before, was one of many factors eventually leading to the demise of U.S. watch manufacturing, aided by the almost universally short-sighted and self-destructive behavior of most of the U.S. companies. The dual American/Swiss nature of Gruen was a big advantage to the company. The Precision Factory was ready to resume normal business, enabling Gruen to recover quicker than many competitors, who had to complete their War contracts and then undergo a painful re-tooling. "the thin, smart watch of the future"
Above: A selection of Pan American models. Left to right: an early (I believe) model with a 28mm yellow gold-filled case and a rose gold dial; the Pan American Ace (30mm gold-filled case); Pan American Official with 31mm rose gold-filled case and white lugs; a woman's model in yellow gold-filled (19mm x 28mm across lugs); the Pam American Challenger (24mm x 31mm). Starting about 1943, Gruen produced a series of pilot's watches with 24-hour dials for Pan American World Airways. During the war, the airline dropped all commerial operations and flew exclusively for the U.S. military. Pan American's network of bases and airports in the Pacific and Asia became a valuable military asset. The Pan American wristwatch models all have sweep seconds (still fairly unusual in the 1940s), Arabic numbers for 1-12 around the outside of the dial, and an inner chapter ring with the numbers 13-24. There was still a glamorous mystique to aviation and airplane travel in the 1940s, and Gruen ran several ads showing pictures of their pilot's watch with the famous Pan American Clipper flying boat. The watches were supplied only to the airline and were not actually available for civilian usethe ads were run to create customer awareness of these watches, which Gruen had big plans for once the War ended. Finally, an October 1945 ad announced that the Pan American line would go on sale to the public. The company believed that postwar consumers would make increasing use of 24-hour time, especially for airline travel. They also reasoned that, having just come through a major war, many people would have become accustomed to military time and could easily make the transition. Gruen published several articles in their dealer newsletters praising the advantages of dials indicating "the 24 hours of the air-world day," and advising retailers to stock up on Pan Americans to meet the anticipated demand. Gruen offered the Pan American in a number of models and variations, in Guildite, gold filled and solid gold cases, for both men and women, and with a variety of lug and case shapes. There were two-tone versions and versions with square cases and dials. There were a variety of dials as well, but just like the original pilot's watches, they all share common features: a 24-hour dial with an inner 13-24 chapter ring and a red sweep seconds hand. As was the practice with the Curvex and Veri-Thin lines, "Pan American" was part of each watch's name: Pan American Challenger, Pan American Eagle, Pan American Navigator. The round watches use the excellent VeriThin 420SS movement. Although the public did not adopt 24-hour time as enthusiastically as Gruen had anticipated, during the late 1940s these watches seem to have been very popular, as they are fairly common on the vintage-watch market today. "marks a man whose time is precious"
Above: A selection of Gruen 21 models, all using the 335 Veri-Thin movement. Using factory space rented from the American Playing Card Company, in the Cincinnati suburb of Norwood, Gruen set up a facility to build American-made movements. Special permission had to be obtained from the Swiss government in order to export the necessary machinery. In 1949, the company introduced their first watches made entirely in the U.S., a line of 21-jewel men's models. The movements are marked "Cincinnati" or "US" instead of the usual "Switzerland." The 21 models use a 21-jewel version of the tonneau-shaped 335 Veri-Thin movement. There is a playful variety of both round and rectangular case styles in the series, in both 14k and gold filled. Since these are the only Gruen watches produced entirely in the U.S., and are not marked "Switzerland" or "Swiss" on the dials, you will sometimes see sellers incorrectly describe them as redials because they don't have any small text at the bottom of the dial. Early models are signed Veri-Thin 21; later models have simply a 21 under the Gruen logo, sometimes enclosed in a gold shield shape. At the Norwood facility Gruen also built some men's 17-j and women's 17- and 21-jewel movements. However, the bulk of Gruen watches still had imported Swiss movements. It is interesting that Gruen, who had manufactured their movements in Switzerland since about 1900, started U.S. production at a time when most other U.S. watch companies were moving production overseas. Fred Gruen retired in 1940 and died in 1945, and his brother George died in 1952. In 1953 the Gruen family sold their interest in the company. The same year, Gruen president Benjamin Katz was forced into retirement after a scandal, and in 1954 the company bought out his shares for $2 million USD. With the changeovers in management and the loss of the Gruen family's involvement, the company lost focus and direction. In 1953, the Gruen Watch Company had its highest sales in its entire history. By 1958, the company (which had changed its name to Gruen Industries) was facing massive legal problems, had laid off most of its employees, and was selling off its properties, including Time Hill. Gruen Industries was so deeply in debt, and had already borrowed so much money, that they were unable to secure additional financing. The board of directors and stockholders were making newspaper headlines with petty squabbles and proxy fights. The company was falling apart, having seriously neglected the watch business as they pursued other activities (watch manufacturing was now relegated to a subsidiary division of Gruen Industries). The company bought the Canadian branch of Waterman Pen in May of 1956, selling off Gruen's own Canadian watch distributorships to finance it, then sold Waterman again in November of the same year, at a loss. To add to their problems, an $8 million USD military contract was cancelled and the company was hit with anti-trust lawsuits by the U.S. government. The "eleventh hour" title of this section was taken from a 1958 newspaper headline. Stories from this period make depressing reading. In 1958, Gruen Industries was broken up and sold in pieces. Under new ownership, Time Hill was closed and the Gruen watch business moved to New York, continuing to produce mechanical watches for about another 15 years. All of the pre-1958 factory records, of no interest to the new owners, were destroyed. Rolex eventually purchased the Precision Factory (it's just across the street from Rolex's main factory) and now it's a Rolex administration building. According to the Cincinnati Business Record, this incarnation of the Gruen Watch Company failed in 1976the article states that poor management and lack of direction caused the firm to go bankrupt. The changeover from mechanical watches to quartz, which devastated the watch industry worldwide, could not have helped matters. M.Z. Berger and Company, located in New York, currently has the license to sell watches under the Gruen brand name in the United States. The company distrubutes a number of brands of cartoon-character and novelty watches (such as ‘Hello Kitty’), as has the rights to some other old American brand names in addition to Gruen. In the early 1990s they made some reproductions of a few original Gruen designs — the Swiss-owned, modern Hamilton made similar reproductions around the same time. M.Z. Berger’s Gruen watches have been primarily quartz, but in the last few years they have introduced some Swiss mechanical models as well. Today in the United States you can walk into discount department stores and see watches with the Waltham, Elgin, Illinois and Pulsar brand names on the dials. All these names have rich histories. Waltham was making pocket watches before the American Civil War, and Elgin was started shortly afterwards. The Swiss were shocked by the very high quality and low cost of Waltham watches from the mid-1800s; this provoked the Swiss into modernizing and industrializing. Illinois was formerly a famous and respected manufactuer of railroad watches. Hamilton’s Pulsar ‘Time Computer’ was the very first quartz wristwatch; it cost $5000USD when introduced in 1970. American watches were once among the highest-quality watches in the worldthey timed the railroads, coordinated the movements of armies, and provided the time reference for air and sea navigation, but the original companies are nearly forgotten. Along with Gruen, these old brand names, today seen only on the dials of foreign-made quartz watches, are the last, lingering ghosts of the American watch industry. Above: I was shocked the first time I walked around the side and saw the large brick block that had been built on Time Hill's east side. 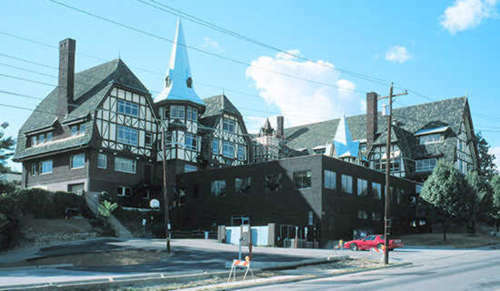 After Gruen's watch business was sold and left Cincinnati, Time Hill was occupied by a calendar company. The interior was extensively modified. The magnificent lobby, with a 20-foot (7 meter) ceiling, huge fireplace, tile floors and very large, unusual chandeliers, was stripped, chopped into two stories and turned into offices. 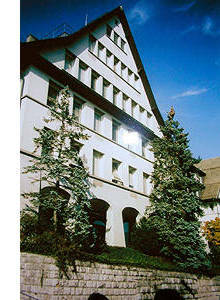 During the 1990s the building was housed an insurance company, and today is owned by the Union Institute, an adult-education school. The Union Institute is doing restoration work on the Time Hill building. They have successfully located some of the original fixtures, and have fabricated reproductions of others. The destruction of Gruen's company records is especially unfortunate for collectors. The lists of serial numbers, dates of manufacture and production quantities, which are available for most vintage watch brands, no longer exist for Gruen. The meticulous records, which tracked each individual customer and watch, are no more. However, if such information were readily available, there would be no reason for these web pages. I am always looking for material from or about Gruen. Please contact me if you would be willing to share material in your collection, or if you can point me to new information. I am always happy to hear comments, corrections and criticism. For those interested in my source materials and comments on some of the Gruen information in print, see sources.